ISIS is threatening to “immediately” kill a Jordanian hostage if Iraqi Sajida al-Rishawi is not delivered for a swap on the Turkish border by Thursday at sunset, according to unverified audio attributed to Japanese hostage Kenji Goto. The audio, which could not be immediately verified, was distributed on Twitter and was accompanied by Arabic text. The man who presents himself as Kenji Goto Jogo says in the audio that he was told to deliver a message that if Sajida al-Rishawi is not delivered to the Turkish border by sunset on January 29 for an exchange, another hostage – a Jordanian pilot – will be killed. The Japanese government is currently analyzing the voice recording, a spokesman for Prime Minister Shinzo Abe's office told Reuters. The recording has yet to be independently verified, but Jordan has so far received no assurance that the pilot is safe. However, the kingdom has agreed to release al-Rishawi if Kasaesbeh's life is spared. On Tuesday, the Islamic State released a video of Kenji Goto Jogo saying that he had 24 hours to live unless Jordan released the convicted extremist woman on death row for her role in a 2005 suicide bombing. Late Wednesday, the pilot's father met with Jordan's King Abdullah II, who assured him that"everything will be fine." If the exchange goes ahead, it will set a precedent for negotiating with the Islamic State, which has not opted for prisoner exchanges in the past. Kasaesbeh was allegedly taken hostage in December, after his plane went down in Syria during the US-led campaign against the Islamic State. Goto was captured in Syria and has been held hostage since October. He went to the country to secure the release of Haruna Yukawa, another Japanese man who was captured by the Islamic State back in August. In the first video released last week, a black-cloaked masked figure with a knife said that Goto and Yukawa would be killed within 72 hours unless Tokyo paid a ransom of US$200 million. 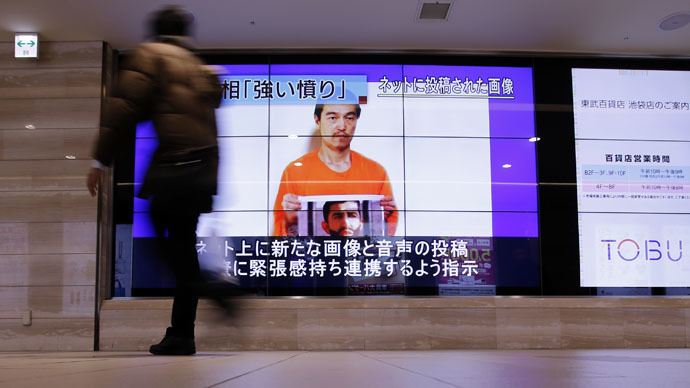 A second video, released on Saturday, showed Goto holding a picture of a decapitated Yukawa and saying that IS was now demanding the release of al-Rishawi.